One word a week for one year; one life changed forever. 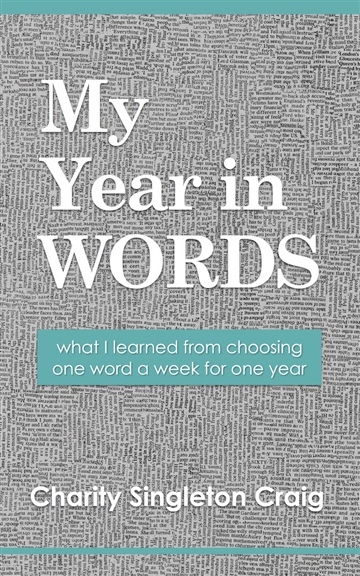 This memoir walks through a year in the life of the author as she reflected on a word of the week. "It seemed like such an ordinary year at the time. We planted a garden, we celebrated holidays, we watched the seasons change, and we went on vacation. But we also moved and made career changes and experienced life in all of its everyday, miraculous glory. If I hadn’t been recording it along the way, we might have missed it. "My Year in Words is significant because I paid attention, I kept track, and I wrote it down. What are you missing by not doing these things?" Charity Singleton Craig is a writer, bringing words to life through essays, stories, blog posts, and books. She is the author of My Year in Words (Glendale Press, September 2016), coauthor of On Being a Writer (T.S. Poetry Press, October 2014), and a contributor to three books, including Letters to Me: Conversations with a Younger Self. She is regularly published at various venues, including The Curator, Edible Indy, In Touch Magazine, The Write Life, Grubstreet Daily, Today’s Christian Woman, The Clinton County Daily News, and Tweetspeak Poetry, where she is a contributing writer and editor. She lives with her husband and three stepsons in central Indiana.